On October 1, 1960, Nigeria gained independence from Britain. An all-Nigerian Executive Council was headed by a Prime Minister, Alhaji Sir Abubakar Tafawa Balewa. On November 16, 1960, Dr. Nnamdi Azikiwe, became the first Governor-General of a Federation of three Regions of the North, East and West, with Lagos as the Federal Capital. Each of the Regions was headed by a Premier with a Governor as Ceremonial Head. On October 1, 1963, Nigeria became a Federal Republic and severed whatever ties were left with the British monarchy, but remained a member of the Commonwealth of Nations. An amendment to the 1960 Independence Constitution replaced the office of the Governor-General with that of the President. Nnamdi Azikwe was sworn into that office on October 1, 1963. The office at that time was primarily ceremonial, and mainly the duties of a head of state, such as receiving foreign dignitaries and opening Parliament. In January 1966, a group of army officers, led by Major Chukwuma Nzeogwu, overthrew the central and regional governments, killed the prime minister, and tried to take control of the government in a failed coup d'état. Nzeogwu was countered, captured and imprisoned by General Johnson Aguiyi-Ironsi. General Aguiyi-Ironsi was named Military Head of State. In July 1966, a group of northern army officers revolted against the government, killed General Johnson Aguiyi-Ironsi, and appointed the army chief of staff, General Yakubu Gowon as the head of the new military government. In 1975, General Yakubu Gowon was deposed and General Murtala Mohammed was the Head of the Federal Military Government of Nigeria until his assassination in 1976. On his death, the Chief-of-Staff, Supreme Headquarters (equivalent to a Vice-President) General Olusegun Obasanjo assumed office head of state in a meeting of the Supreme Military Council, keeping the chain of command established by Murtala Muhammed in place. Gen. Obasonjo was responsible for completing the democratic transition begun by his predecessor, which culminated in an election in August 1979. In 1979, Nigeria adopted a federal presidential constitution, with provision for an executive President as head of government, and a National Assembly, comprising a Senate and House of Representatives. This transformed the Presidency into the form we know it as today. In October 1979, after more than 13 years of military rule, Nigeria returned to democratic rule. The National Party of Nigeria emerged victorious in the presidential election and Alhaji Shehu Shagari was elected President. On December 31, 1983, the military overthrew the Second Republic. Major General Muhammadu Buhari emerged as the Chairman of the Supreme Military Council (SMC), the new Head of State. In August 1985, General Buhari's government was peacefully overthrown by Army Chief of Staff, Major General Ibrahim Babangida. Babangida became the President and Chairman of the Armed Forces Ruling Council. In August 1993, General Babangida stepped down and chose an interim government to replace him. Ernest Shonekan was named as interim president. General Sani Abacha seized power from Shonekan in November 1993 and became the President and Chairman of the Provisional Ruling Council. On 8 June 1998, General Abacha died at the presidential villa in the Nigerian capital, Abuja. Major General Abdulsalami Abubakar became the new President and Chairman of the Provisional Ruling Council. In May 1999, Major General Abdulsalami Abubakar stepped down, and the former military head of state, Olusegun Obasanjo, became the newly elected civilian president. Obasanjo served two terms in office. In May 2007, Alhaji Umaru Yar'Adua was sworn in as President of the Federal Republic of Nigeria, the 13th head of state of Nigeria. Yar'Adua died on 5 May 2010 in the Presidential villa, in Abuja, Nigeria. On 6 May 2010, the Vice President Goodluck Jonathan was sworn in as President of the Federal Republic of Nigeria and the 14th head of state. 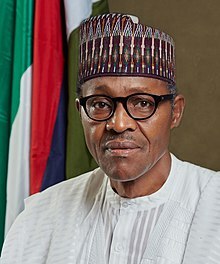 On 29 May 2015, Muhammadu Buhari was sworn in as President of the Federal Republic of Nigeria and the 15th head of state after winning the general election. The President has the powers entrusted by the Constitution and legislation, including those necessary to perform the functions of Head of State and Head of the national executive. They have presented a forged certificate to the Independent National Electoral Commission. I do solemnly swear/affirm that I will be faithful and bear true allegiance to the Federal Republic of Nigeria; that as President of the Federal Republic of Nigeria, I will discharge my duties to the best of my ability, faithfully and in accordance with the Constitution of the Federal Republic of Nigeria and the law, and always in the interest of the sovereignty, integrity, solidarity, well-being and prosperity of the Federal Republic of Nigeria; that I will strive to preserve the Fundamental Objectives and Directive Principles of State Policy contained in the Constitution of the Federal Republic of Nigeria; that I will not allow my personal interest to influence my official conduct or my official decisions; that I will to the best of my ability preserve, protect and defend the Constitution of the Federal Republic of Nigeria; that I will abide by the Code of Conduct contained in the Fifth Schedule to the Constitution of the Federal Republic of Nigeria; that in all circumstances, I will do right to all manner of people, according to law, without fear or favour, affection or ill-will; that I will not directly or indirectly communicate or reveal to any person any matter which shall be brought under my consideration or shall become known to me as President of the Federal Republic of Nigeria, except as may be required for the due discharge of my duties as President; and that I will devote myself to the service and well-being of the people of Nigeria. So help me God. ^ Ibeh, Nnenna (30 May 2015). "Buhari to earn N14 million as annual salary, allowances". Premium Times. Retrieved 30 May 2015. ^ "bookreader demo". credo.library.umass.edu. Retrieved 2019-04-11.